ASHGABAT, Turkmenistan (April 3, 2015) – World Taekwondo Federation (WTF) President Chungwon Choue today called for the support of the IOC, the U.N. and International Federations to help make the Sport Peace Corps a reality during a speech at the 2015 Turkmenistan International Sports Media Forum (TISMF). 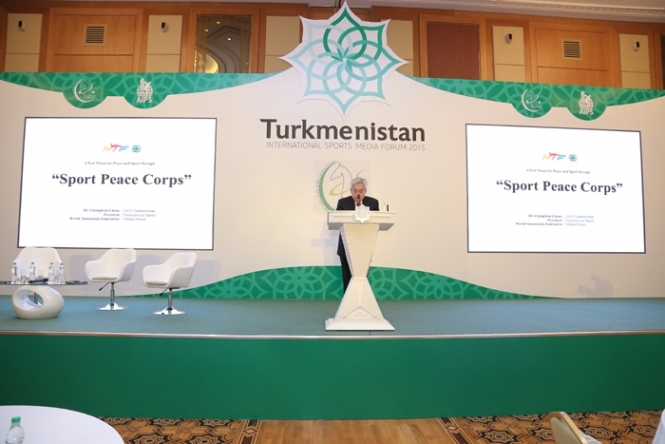 Speaking just three days ahead of the International Day of Sport for Development and Peace, President Choue outlined his vision for the Sport Peace Corps and its potential to promote peace and development around the world. The Sport Peace Corps comprise coaches, athletes and educators who would be dispatched to assigned communities to provide sports equipment, training and education. Through the Sport Peace Corps, young people will gain a greater understanding of different cultures and nations and learn to live healthier lifestyles. These values are closely aligned with those of the IOC and the U.N. and the WTF has begun discussions with the two global organizations about supporting the initiative. “Since I took over as president of the WTF in 2004, I have strongly believed in the principle that sport should act as a vehicle to promote friendship, respect, and peace. As an Olympic sport, we have been committed to working with the IOC to promote the Olympic values throughout the world. 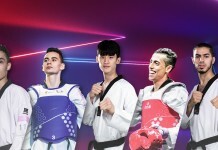 The WTF are looking to build on the success of the WTF Taekwondo Peace Corps which were first launched in 2008 to instil self-awareness and discipline in young people. Since 2008 around 1,300 volunteers have been dispatched to over 100 countries worldwide.